Regardless, on their "off" days, patients will often show signs of fluid buildup that may result in elevated blood pressure. Hourly averaged crude effects of heart rate and blood pressure during and after exposures to concentrated ambient particle and filtered air, using measurements during exposure to room air as a baseline, are shown in Figure 1. All the major trials find that lowering blood pressure reduces the risk of stroke by 35 to 40 percent in people with hypertension," says Norman Kaplan of the University of Texas Southwestern Medical Center in Dallas. High blood pressure is one of the leading causes of kidney failure, also commonly called end-stage renal disease (ESRD). According to an advisory by the National High Blood Pressure Education Program, that is the same group that has the poorest hypertension control rate. When your blood pressure is measured, many things can affect the result. In addition, the Dietary Guidelines point out "that there is no way at present to tell who might develop high blood pressure from eating too much sodium," alluding in this way to the absence of conclusive research that hypertension is ever caused by eating too much salt. Had his blood pressure continued to rise, had his parents not been able to check his blood pressure, had they told him to stay in bed and sleep his headache off, he could have sustained cerebral hemorrhages and permanent brain injury. 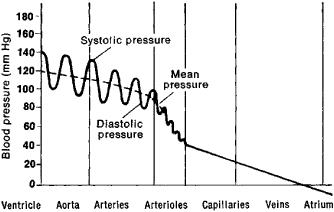 Blood pressure is given as two numbers--the systolic pressure over the diastolic pressure, and both are important. The glomerular filtration rate decreases to less than 75 milliliters per minute, large amounts of protein pass into the urine, and high blood pressure almost always occurs. Blood pressure is the force of blood against the walls of the arteries in the body as it circulates to supply nutrition and oxygen to the cells. A recent study also found that the damage to the heart and blood vessels can occur in youth at blood pressure levels that are below the clinical definition of hypertension in youth.